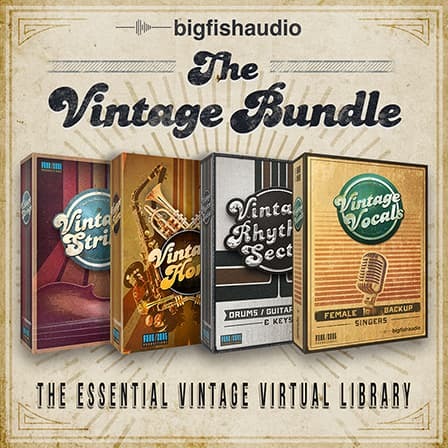 Big Fish Audio - The Vintage Bundle - A massive bundle of beautifully crafted instruments at an unbelievable price! Save $300 with the new ultimate vintage virtual library! 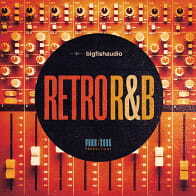 Big Fish Audio and Funk/Soul Productions are proud to present The Vintage Bundle! This collection includes full versions of Vintage Strings, Vintage Horns, Vintage Vocals, and Vintage Rhythm Section. There is no better set of virtual instruments on the market to help nail that sweet vintage tone and vibe we all know and love. Now you can have all four best-selling instruments at an all-time low price! Vintage Horns is a horn section virtual instrument that gives you every instrument you need to emulate the classic horn section sounds of R&B, Soul, and Funk bands from the '60s and '70s. It is available for Kontakt Player 5 and as a ReFill for Reason 6.
switching to flugel horns on ballads. 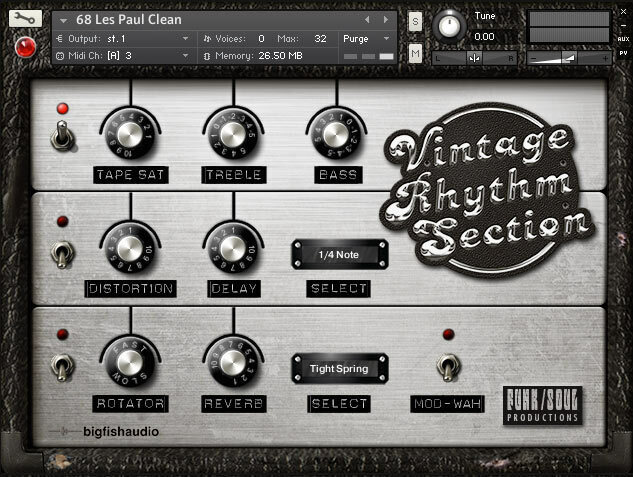 Vintage Strings is a virtual instrument for Kontakt 5 designed to emulate the classic violin string section sounds of R&B, Soul, and Funk records from the 1960's and 1970's. Whether you're an experienced arranger or casual producer, Vintage Strings was designed to make it quick and easy for you to create great sounding string tracks for your productions. Like its sister product, Vintage Horns, Vintage Strings was not designed to be a shiny, perfect sounding virtual instrument. Instead, we tried to capture the way string sections sounded back in the '60s and '70s; including the decidedly not classical playing style and minor imperfections that added character to those sections and made them sound so good. The 2VLN patches are very useful for creating the sound of smaller string sections. Even if played in 3-part harmony, these patches sound like a 6 piece section, rather than a full orchestral string section. The 2VLN patches take up a lot less sonic space in the mix, and also have the advantage of sounding like the smaller types of string sections used on a lot of old Soul and R&B records, which didn't have the time or budget to record a larger section. The 6VLN patches are great for recording unison (1 part) lines that emulate the sound of a true 6 violin section, which was very commonly used in many old Soul recordings. When used for 2-part harmonies or octaves these patches can be used to replicate the sound of an overdubbed 6 violin section (i.e., a faux 12 violin section), which was a very common recording technique used on many Motown recording sessions. The 12VLN patches are very useful for creating unison (1 part) string lines that sound like an overdubbed 6 violin section. If you want to get a bigger sound with the size of a larger orchestral string section, without the color and character present in a large recroding hall or symphonic space, use the patches for string parts in 2 or 3 part harmonies. The result is a virtual instrument that has a sound and character that is distinctly different from orchestral based sampled string libraries. The sound of Vintage Strings is intentionally not big, rich, and glossy. It's a smaller, more intimate, and more "human" sound, which more accurately emulates the string sound on those classic old records. If you don't have a lot experience writing for strings, or even if you're an experienced string-arranger on a tight deadline, Vintage Strings also offers a number of pre-programmed instrument patches that can help you quickly create great sounding string parts. These include the Tonal Harmonization Patches, which contain 2 part, 3 part, and 4 part patches for 2, 6, and 12 violins. Playing with just one finger on your keyboard you can easily write string lines in 2 parts (intervals), 3 parts (triads), or 4 parts (seventh chords). Secondly, the Tonal Harmonization patches include Fixed Chord & Interval Patches containing 2 part, 3 part, and 4 part Chord Patches, for 2, 6, and 12 violins. These patches are programmed to play a specific interval or chord according to the type of patch in 12 different keys. 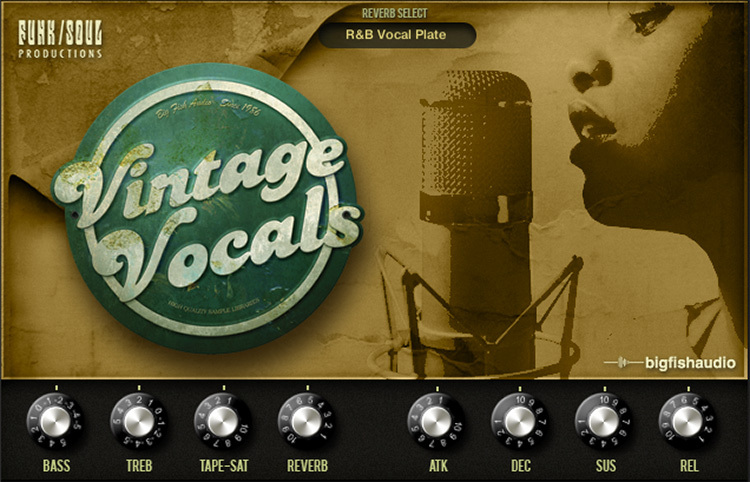 The Vintage Strings graphical user interface (GUI) is very simple and easy to use. The main page of the interface includes control over tape saturation, high EQ, and reverb with 15 custom selected convolution reverbs. On the Harmonize page you can choose the key and scale of the interval or chord-based preset patches, or create custom interval and chord-based patches of your own. While there's no replacement for live singers, Vintage Vocals does its best to close the gap and works well when used to create harmonized background pads, unison lines, and accents. Also included are several pre-programmed chord patches that can be used to create three-part harmonized backgrounds by playing with just one finger. female background singers, including the stylistic quirks and minor imperfections that made them sound so good. The three singers we recorded for this product - Angela Clemmons, Janice Dempsey, and Tiffany T'Zelle Wilson - have decades of experience recording and performing on countless R&B, Funk, Soul, and Gospel projects. They sing with the same kind of heart and Soul as the great background singers who provided the inspiration for this product. We thank them for the energy and talent that they brought to this project. 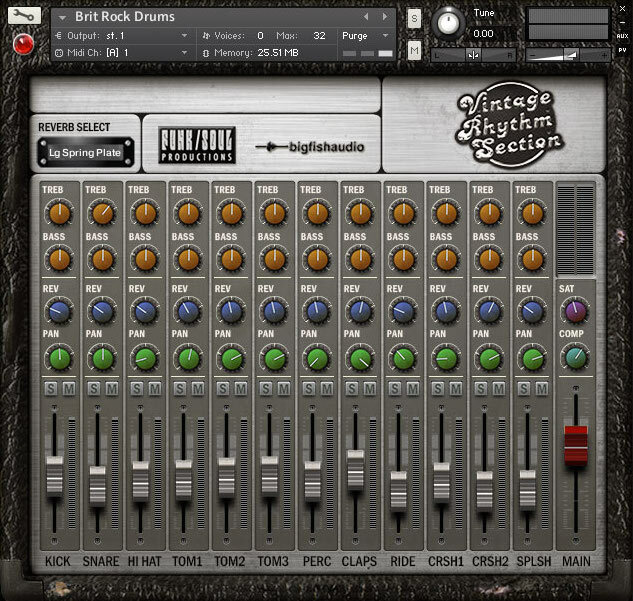 The Vintage Horns reFill includes 53 NN-XT sampler patches, with five different articulations for all instruments: Long notes, Short notes, Stabs, Falls, and Swells. For brass and reeds, we also included Sforzando samples. major & minor runs up and down, fall-offs, tremolo, harmonics, and pizzicato. Mac: Intel Core Duo, 2GB of RAM, and OS 10.7.x or later. For optimum performance, Big Fish Audio recommends a 2.0GHz processor or faster. The library requires 5.1GB of free hard drive space. Windows; Windows 7 or Windows 8 (latest Service Pac, 32/64 Bit) Intel Core Duo or AMD Athlon 64, and 2GB of RAM. For optimum performance, Big Fish Audio recommends a 2.0GHz processor or faster. The library requires 5.1GB of free hard drive space. The keys marked in red on Kontakt's virtual keyboard are known as key-switches. By pressing a key-switch, you can change from one vocal sound and articulation, to another - for example, from Oohs Sustains to Oohs Staccatos, Ahs Swells, or Ohs Sustain (the default for all vocal patches). For single-patches and Multis, the active key-switch will be yellow in color. All three singers, singing in unison. Includes all vowel-sounds, with just the Sustain articulation. This patch works great for creating triple-tracked unison lines or vocal pads. All three singers, harmonized in major chords. Includes all vowel-sounds, with just the Sustain articulation. Played with one finger, this patch can be used to easily create triple-tracked major chord background parts. All three singers, harmonized in minor chords. Includes all vowel-sounds, with just the Sustain articulation. Played with one finger, this patch can be used to easily create triple-tracked major chord background parts. Each singer has a separate instrument-patch, and each patch is on a different MIDI channel. The three are singing in unison, and all vowel-sounds and articulations are included. Each singer has a separate instrument-patch, but all are on the same MIDI channel. Each voice is assigned one part in the harmonized major chord, and all vowel-sounds and articulations are included. Each singer has a separate instrument-patch, but all are on the same MIDI channel. Each voice is assigned one part in the harmonized minor chord, and all vowel-sounds and articulations are included. Each singer has a separate instrument-patch, but all are on the same MIDI channel; all are singing in unison, and all vowel-sounds and articulations are included. The Following End User License Agreement is included with Vintage Bundle, The. This License is only valid for the individual who has purchased an unopened, new and lawfully made copy of Vintage Bundle, The from a dealer or distributor authorized by Big Fish Audio. "End User License Agreement: The samples contained herein are licensed, not sold to you, the individual end user, by Big Fish Audio. This non-exclusive, non-transferable license is granted only to the individual end user who has purchased an unopened, new and lawfully made copy of this product from a dealer or distributor authorized by Big Fish Audio. All samples remain the property of Big Fish Audio and are licensed only for use in the creation of a live or recorded performance that includes the licensed samples as part of a derivative musical work created by the licensed end user. This license expressly forbids resale, rental, loan, gift or transfer of these samples in any format or via any medium, except as part of a derivative musical work. The samples may not be included, whether unmodified or as part of a derivative work, in any sample library product. Any unlicensed usage will be prosecuted to the maximum extent possible under the law."